Alesonor, the real estate developer with over 15 years of experience in the luxury residential market, is starting a major project in northern ​​Bucharest – the first green suburb area in Romania, an investment estimated at approx. 100 million euros.The project will feature over 400 green villas, which will benefit from a complete, high-quality infrastructure and the proximity of a dedicated area for the family – school, kindergarten and afterschool, co-working spaces with conference rooms, dedicated areas for recreation, sports, spa, restaurants and shopping, as well as direct access to the Baneasa Forest, the largest forest around Bucharest. “Having the experience of the successful development of the Amber Gardens residential complex in Tunari, we have chosen to continue investing in a representative project in the same area of Pipera-Tunari. We consider this northern part of the city to have the greatest potential for long term development, from administrative point of view and also from its position.”, said Alex Skouras, Managing Partner Alesonor. The Pipera – Tunari area has several investment advantages compared to other residential areas in the northern part of the city: Tunari is the only residential area in northern Bucharest that has quick access to the ring road of the city, DN1, Pipera-Tunari road, A3 motorway and Henry Coanda International Airport. The infrastructure getting better by the year, on-going development, existing utilities network, urbanization plan in Tunari and reduced taxes for the green projects, public transportation, commercial centres in the proximity, sport, recreation and leisure centres, the appreciated network of schools and kindergartens, the forest in the vicinity, demonstrates the long-term development potential of the area and are indicatives of an increase in investment value. Developed on ​​31 hectares, the project will have an opening of approx. 1 km to the Baneasa forest and it is remarkable through a unique masterplan: 85% of land without construction and the lowest land use coefficient, being dominated by green spaces and low rise buildings. “Today, the forests are grubbed up to build buildings. Our main focus is to extend the forest in the community that will be built.”, said Alex Skouras Managing Partner Alesonor. The first green suburb area in Romania will integrate buildings with high-end design and advanced technological solutions, while respecting nature and the quality of life of those who will choose to live there. “At Amber Gardens, we have committed to demonstrate that true luxury is green and we have managed to increase comfort standards in every home. With the new project, we aim to extend this philosophy to a community level. It is a luxury for our children to have their appreciated school at a walking distance or to be unaccompanied when they go to the kindergarten or to the park, and for us to take a walk at the restaurant, shopping, at the gym, or run into the woods in the morning. This luxury will become the standard of the first green suburb area in Romania. We are addressing all those who aspire to a well-balanced lifestyle that are concerned about the quality of their life and the comfort of their personal home, and who want to grow up their families in a community in the middle of nature, in a carefully planned suburb area, from urban planning, infrastructure, design and community involvement in creating an active social life.”, said Alex Skouras, Managing Partner Alesonor. Recognized for its expertise in innovative, modern design and high-quality, energy-efficient and environmentally responsible constructions, the Alesonor team of experts has received numerous awards and certifications for its projects, including the first ”Green Home” certification in Bucharest, awarded by Romania Green Building Council (RoGBC), in 2014, the first prize at the prestigious “Bucharest Annual Architecture” competition, the Green Project of the Year, awarded by RoGBC in 2015, the Green Luxury Project of the Year, awarded by the Forbes Romania, two years in a row – 2015 & 2016, The Innovative Project of the Year, awarded by Business Magazine, in 2015, Environmental Project of the Year, awarded by ARM in 2016, The most innovative project, awarded by CPI in 2016. Alesonor’s team includes architects, engineers, builders, project managers, financial experts, market analysts, sales, marketing and PR who have been involved in analyzing the market and designing the first green suburb area in Romania for over two years. Alesonor is a real estate developing company, founded in Romania in 2003. Since approximately 15 years, Alesonor has been investing in successful real estate projects, including commercial and industrial projects, but having as main objective the development of luxury residential and also environment friendly projects, a field in which the company has gained important experience on the Romanian market. Alesonor has successfully developed and sold the following residential projects in Bucharest: Clover Residence, Magnolia Residence, Ivy Office Residence, Almond Tree Residence, Amber Gardens. Amber Gardens is the first large scale residential project in Romania with luxury green homes that integrates bioclimatic design and follows the passive house standard, the most performant energetic standard in the world. The Amber Gardens complex imposed Alesonor as the most important residential villa developer in Romania, and at the same time as a promoter of green, energy-efficient buildings. 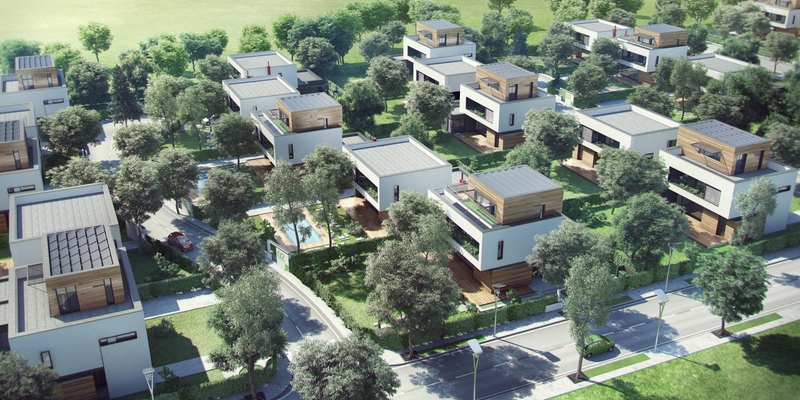 Amber Gardens is the first residential project in Romania with green luxury & intelligent homes. Our project was the first to receive even since 2015 the “Green Homes” Certification offered in Romania by Romania Green Building Council (RoGBC). Subscribe to our Newsletter and stay connected with our community!